Other things being equal, which they never are, a more powerful theme will provoke a more powerful performance. Yet some very dull books have been written about God, and some very fine ones about how to make a living and stay fairly honest. Steve stared into her eyes and said softly: "I'm an occasional drinker, the kind of guy who goes out for a beer and wakes up in Singapore with a full beard." I bent over and took hold of the room with both hands and spun it. When I had it nicely spinning I gave it a full swing and hit myself on the back of the head with the floor. There was a smell of food and liquor and perfume and face powder. The dance floor was an empty splash of amber light and looked slightly larger than a screen star's bath mat. Francine Ley said: "I didn't have anything to do with it, Johnny." Her voice was as dead as the summer before last. so if you live in los angeles i wouldn't mind having a look in your basement, is what i'm saying. 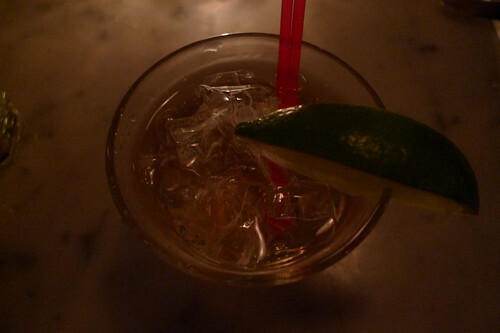 *per terry lennox in the long goodbye, "a real gimlet is half gin and half rose's lime juice and nothing else. it beats martinis hollow." ***thomas pynchon. i will find you, pynchon. had i the patience to work it out, i'd make an ASCII gimlet. easy on the ice. the lethal cocktail, as it were, of instant gratification and sloth was what sealed my fate, H; i needed to make the gesture IMMEDIATELY, but i was unwilling to replan our evening to accommodate it. ironically, our good friend lesley is queen of cocktails in these parts. i must never tell her this story.